The effective use of social and participative media is seen as a key requirement in 21st Century academic practice and professional development. This case study describes a collaborative, student-led initiative which, identifying a gap in existing Doctoral training provision, engaged in delivering a series of interactive sessions to PhD students and Early Career Researchers at the University of Nottingham. With an emphasis less on the technologies and more on their social, participatory and collaborative affordances, the sessions were designed and presented by two PhD students to raise awareness of social media and provide an opportunity for discussion and shared practice. Hosted and supported by one of the University Graduate Centres, the sessions were supplemented by an online resource. In this presentation, we will summarise the initiative with key observations, perspectives and feedback from the organisers and attendees, discuss implications for practice within training and professional development contexts, and outline future plans in this area. It’s a long tradition in the build-up to the Football World Cup to procure a half-decent wallchart to adorn a bedroom wall or the back of the kitchen door. Once the tournament is under way, the results, goal scorers and group standings are ritually inserted in the spaces provided (at least until England make their usual exit in the quarter finals, after which it all seems a bit pointless). Traditionally, these are newspaper or magazine freebies or, more recently, digital promos to download and print. 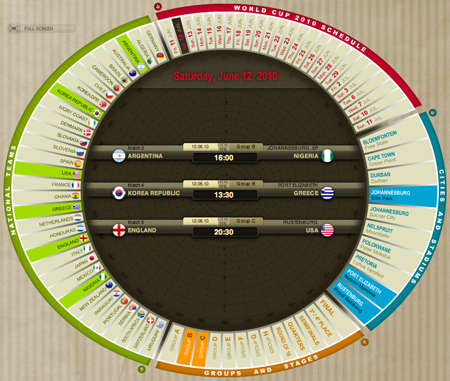 This year, those clever people at Marca.com, the Spanish sports website, have created a fabulous Flash-based interactive calendar for the forthcoming tournament in South Africa. It’s available in both Spanish and English versions and can be viewed in glorious full-screen. I particularly like the cross-referencing by date, stadia, team and group / stage, and I assume it will be automatically updated as the matches take place.